To see the changes made in 2015, Click here. Design and implement a backyard wildlife habitat improvement project and report the results. List the wildlife species in your state that are classified as endangered, threatened, exotic, game species, furbearers, or migratory game birds. Start a scrapbook of North American wildlife. Insert markers to divide the book into separate parts for mammals, birds, reptiles, amphibians, and fish. Collect articles on such subjects as life histories, habitat, behavior, and feeding habits on all of the five categories and place them in your notebook accordingly. Articles and pictures may be taken from newspapers or science, nature and outdoor magazines; or from other sources including the Internet (with your parent's permission). Enter at least five articles on mammals, five on birds, five on reptiles, five on amphibians, and five on fish. Put each animal in alphabetical order. Include pictures whenever possible. 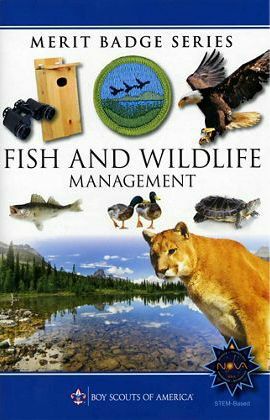 Using resources found at the library and in periodicals, books, and the Internet (with your parent's permission), learn about three different kinds of work done by fish and wildlife managers. Find out the education and training requirements for each position.